Boom! Pow! Whoosh! No, this is not an episode of Batman in the making, but the essential elements of sound every fiction writer must incorporate into their writing. Many writers are familiar with the ways in which sounds can improve their storytelling. No matter if you write in first person or third person, your story (and ultimately, your readers) benefit when you bring in other senses. Think about the last time you smelled a freshly baked cake coming out of the oven or watched the tangerine glow of a sunset. Can you smell the sugar and flour hanging in the air or visualize the glowing horizon? In the same way that smell and sight memories trigger our senses, so too can the description of sound help us relate to the action in a story. Onomatopoeia is a term that describes when a word is formed from the sound associated with what it’s named. Words like sizzle and snap and ping are perfect examples of onomatopoeia you can use not only to describe the sound within description, but the words also stand alone as verbs. Are you hungry yet after reading that? I sure am! Using the concept of onomatopoeia in your storytelling helps your readers use other senses to understand what is taking place. 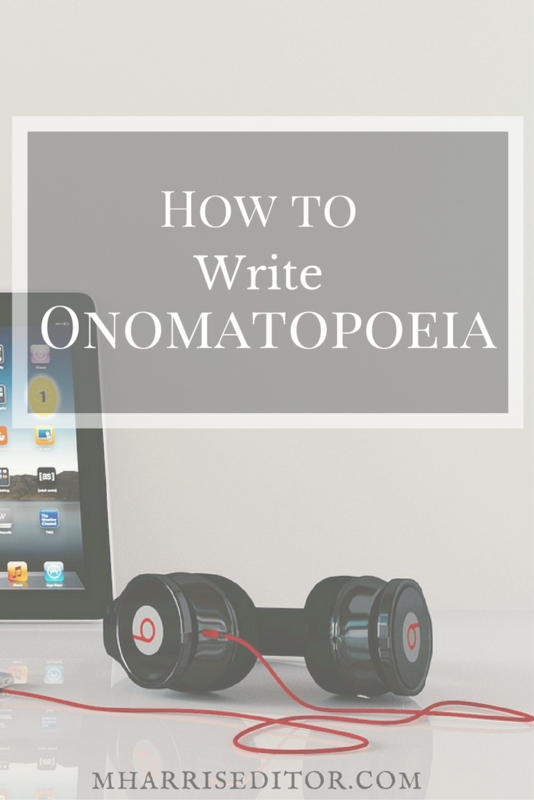 You want your readers to engage the story, and applying onomatopoeia helps with the idea of “show, don’t tell” many writers adopt in order to enrich their stories. There is no better place to be as a writer than when a reader feels like they’re part of the action. That participation is essential to your success, so it’s important to incorporate it as often as you can. Adding in sensory elements using onomatopoeia assists this. One of my favorite examples from over the years working as an editor for fiction writers comes from Jeff Altabef’s SHATTER POINT (no spoilers below). In the scene where sound is a crucial element of storytelling, a character throws a tennis ball against a wall repeatedly during a conversation until his brother knocks it away in annoyance. Readers can almost feel the frustration build as the ball repeatedly hits the wall and experience reliefs as the noise stops. When working on this scene, it was important to not only incorporate the sound of the ball, but build up the tension. The author and I worked together to get this right because if done correctly, onomatopoeia can put the reader in the setting as if it’s happening in real time, regardless of the book being written in first person or third person (and, rarely in fiction, in second person). 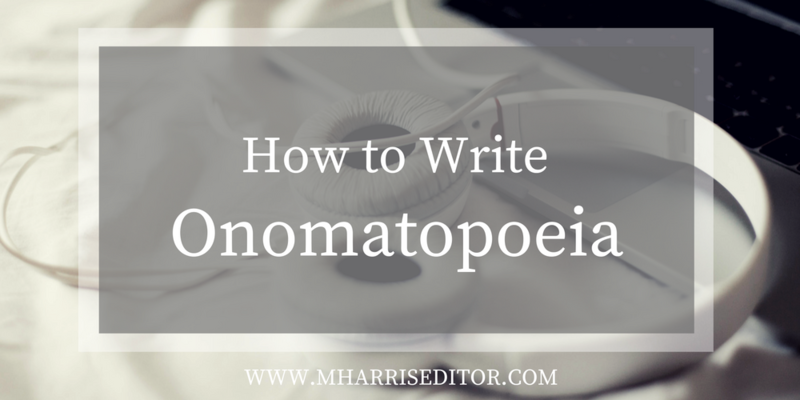 In your first draft, you might not think a lot about how to format onomatopoeia, and that’s okay so long as you revisit it in the editing stage. You might want to get feedback from other people as you revise so that more than one set of eyes can read the words, and this is especially important when polishing a rough draft. Below are some examples of formatting onomatopoeia in your later drafts so that you can help a reader understand the significance of an action scene, sound, smell, etc. without taking them out of the story. In general, sounds in fiction are formatted using italics. If the context requires the sound to stand alone for emphasis, it is usually recommended the author use the sound on its own line. If someone is describing sound in first person narrative, there are instances where italics might include dashes. Or, if you wish to forego the dashes when using a sound in your narrative, you can still use italics and commas to emphasize the onomatopoeia and add a “beat” where appropriate. This formatting parallels human speech and makes it easier for readers to understand the emphasis on the sounds. Both of the examples above emphasize the unseen action (a person running through a glass door) and someone’s observation of what happened. Pop! The champagne cork bounced off the wall as Alex and his bride, Virginia, celebrated their nuptials at the reception. In third person narrative, the rules for formatting onomatopoeia are similar to first person in terms of using dashes; some choose to use them whereas others don’t. No matter what you choose, make sure it is consistent and reads right. There is nothing worse than trying to emphasize something in your novel only for noticeable formatting differences to take place. It can be daunting to figure out the how and why of writing sounds into your story, but with a little practice, you can learn to do it in no time! And if you’re still having trouble, contact an editor who can help! Enjoy this post? Need more inspiration and resources? Check out my author resources page for more!